A thermometer is a device used to measure temperature. The thermoscope, developed by Galileo around 1592, was the first instrument used to measure temperature qualitatively. It was not until 1611 that Sanctorius Sanctorius, a colleague of Galileo, devised and added a scale to the thermoscope, thus facilitating quantitative measurement of temperature change. By this time the instrument was called the thermometer, from the Greek words therme ("heat") and metron ("measure"). About 1644 it became obvious, however, that this instrument—comprising a large bulb flask with a long, open neck, using wine to indicate the reading—was extremely sensitive to barometric pressure. To alleviate the problem, Grand Duke Ferdinand II of Tuscany developed a process to hernetically seal the thermometer, thereby eliminating outside barometric influence. The basic form has varied little since. There are many types of thermometers in use today: the recording thermometer uses a pen on a rotating drum to continuously record temperature readings; the digital readout thermometers often coupled with other weather measuring devices; and the typical household types hung on a wall, post, or those used for medical purposes. With a thermometer, temperature can be measured using any of three primary units: Fahrenheit, Celsius, or Kelvin. At one point during the eighteenth century, nearly 35 scales of measure had been developed and were in use. In 1714 Gabriel Daniel Fahrenheit, a Dutch instrument maker known for his fine craftsmanship, developed a thermometer using 32 (the melting point of ice) and 96 (the standard temperature of the human body) as his fixed points. It has since been determined that 32 and 212 (the boiling point of water) are the scale's fixed points, with 98.6 being accepted as the healthy, normal body temperature. Swedish scientist Anders Celsius, in 1742, assigned 0 degrees as the point at which water boiled and 100 degrees as the point at which ice melted. These two figures were eventually switched—creating the scale we know today—with 0 degrees as the freezing point of water and 100 degrees as the boiling point. Use of this scale quickly spread through Sweden and to France, and for two centuries it was known as the centigrade scale. The name was changed in 1948 to Celsius to honor its inventor. In 1848 another scientist, Lord Kelvin (William Thomson), proposed another scale based on the same principles as the Celsius thermometer, with the fixed point of absolute zero set at the equivalent of -273.15 degrees Celsius (the units used on this scale are called Kelvin [K]). The freezing and boiling points of water are registered at 273 K and 373 K respectively. The Kelvin scale is most often used in scientific research studies. 1 First, the raw glass material is received from an outside manufacturer. The tube is made with a fine passage, or bore, throughout its length. The bored tubes are checked for quality; any rejected parts are sent back to the manufacturer for replacement. 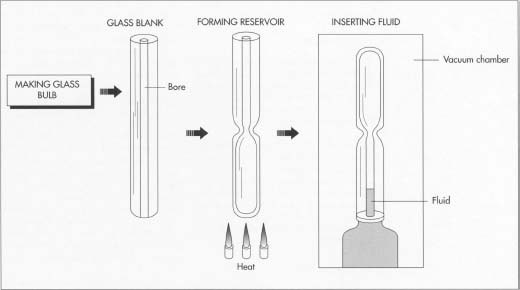 2 The bulb reservoir is formed by heating one end of the glass tube, pinching it closed, and using glassblowing and the application of an air-driven torch to complete it. Alternately, the bulb can be made by blowing a separate piece of lab material that is then joined with one end of the glass tube. The bulb is sealed at its bottom, leaving an open tube at the top. 3 With the open end down in a vacuum chamber, air is then evacuated from the glass tube, and the hydrocarbon fluid is introduced into the vacuum until it penetrates the tube about 1 inch (2.54 centimeters). Due to environmental concerns, contemporary thermometers are manufactured less with mercury and more with a spirit-filled hydrocarbon liquid. Such a practice is mandated (with tolerance for a limited use of mercury) by the Environmental Protection Agency (EPA). 4 Once full, the tube is placed upon its bulb end. A heating-out process is then conducted by placing the thermometer into a warm bath and raising the temperature to 400 degrees Fahrenheit (204 degrees Celsius). Next, the temperature is reduced to room temperature to bring the residual liquid back to a known level. The open end of the thermometer is then sealed by placing it over a flame. 5 After the tube is sealed, a scale is applied based on the level at which the fluid rests when inserted into a water bath of 212 degrees Fahrenheit (100 degrees Celsius) versus one at 32 degrees Fahrenheit (0 degrees Celsius). These reference points for the desired scale are marked on the glass tube before engraving or silkscreening is done to fill gradations. 6 The range lengths vary according to the design used. A scale is picked that best corresponds to even marks between the reference points. For accuracy purposes, engraving is the preferred method of marking. The marks are made by an engraving engine after the thermometer is placed in wax. The numbers are scratched onto the glass and, once complete, the thermometer is dipped in hydrofluoric acid to seal the engraved markings. Ink is then rubbed into the marks to highlight the scale values. When enclosures are used on the scales, a silkscreening process is used to apply the marks. 7 Finally, the thermometers are packaged accordingly and shipped to customers. 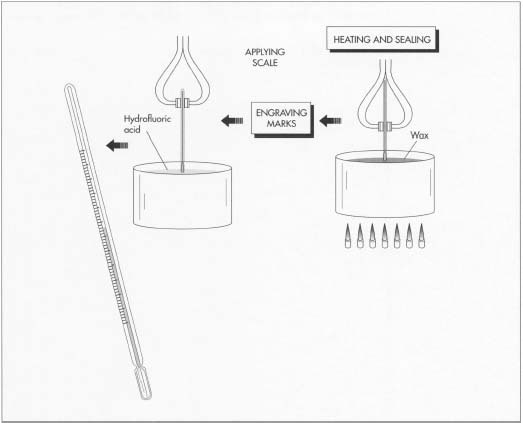 After the bulb reservoir is formed and the liquid inserted, the unit is heated and sealed. Next, the scale markings are added. This is done using engraving, in which the bulb is dipped in wax, the marks engraved, and the bulb dipped in hydrofluoric acid to seal the marks on the glass. forms continue to evolve. With technological advances and the more widespread use of lighter and stronger materials, manufacturers of electronically integrated temperature instruments can provide more accurate measurements of temperature with minimal equipment bulk and at an affordable price. Analog box thermometers, for example, were once used with a long wire and probe tip for in-ground temperature measurements, among other uses. Today, the probe tips are made of lighter materials, and the boxes, loaded with digital electronics, are not as bulky and square. Looking ahead, further work with the microchip may provide the impetus to fully digitize the temperature measuring process. Also, it may eventually be possible to direct an infrared beam into soil and extract a temperature reading from a target depth without even touching the soil. Gardner, Robert. Temperature and Heat. Simon & Schuster, 1993. McGee, Thomas D. Principles and Methods of Temperature Measurement. John Wiley & Sons, 1988. Pavese, F., ed. Modern Gas-Based Temperature and Pressure Measurements. Plenum Publishing, 1992. Alderman, Lesley. "Stick It In An Ear," Money. January, 1993, p. 19. "Fever Thermometers," Consumer Reports. December, 1988, p. 214. DiChristina, Mariette. "Thermometer You Swallow," Popular Science. March, 1990, p. 113. "Taking the Heat from Inside," Discover. June, 1988, p. 12. Joyce, Mary E. "Thermometer Assists in Cancer Therapy," Design News. September 21, 1992, p. 46.
this really helped me with a school project essay! Thanks!